Barely a recipe, more of an unusual way to serve feta cheese. I got this idea from my sister – thanks sis! Baked feta is quite unexpectedly soft to the point of being wobbly. You can flavor it with any herbs or spices you like and the great thing is that once it’s cooled down and firmed up again, you’ll have a lovely fragrant cheese whereas before it just smelled of feta; not a bad thing but this is a far better feta! Serve it hot with crackers or toasts, or perhaps just eat it with a spoon. Take a sheet of aluminum foil large enough to make a sealed parcel with a bit of space at the top. Put a bay leaf, a lemon slice or two, a few shards of garlic and a couple of sprigs of your favorite herbs in the center of the foil. 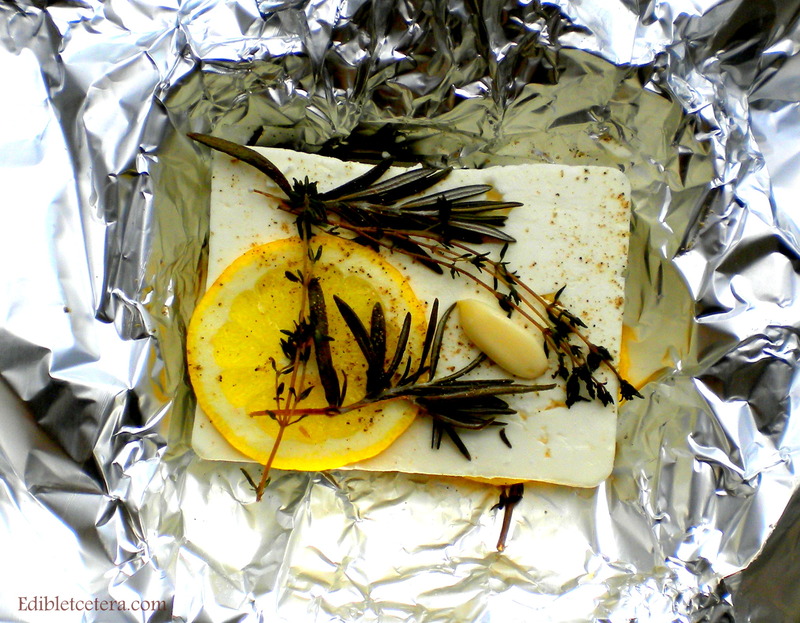 Lift the feta out of the brine and without patting it dry, plonk it straight on top of the herbs, lemon & garlic. Put the same herbs lemon and garlic on top and give it a really good grind of black pepper, then seal the foil making sure no steam can escape. Note – feta contains enough salt so there’s no need to add any and the moisture from the brine helps keep the cheese moist. Bake in the preheated over for 20-25 minutes – unwrap carefully and as it will be a bit floppy, carefully transfer the feta to a plate and serve immediately with whatever you like to serve hot cheese with. Some olives on the side would be nice. You could also press slices of sun-dried tomatoes (in oil) into the cheese prior to baking, or perhaps fennel seeds, pine nuts, dried chili, etc. Whatever you use will give you a more fragrant feta once it’s cooled and firmed up again – that is if you have any left over. This entry was posted in Made in Under 30 mins, Salads & Appetizers, Vegetables / Vegetarian. Bookmark the permalink. Yum – I must try this soon!